My friend Brooke gave me an award. Thanks, you're the best. And to be completely honest, I kinda forgot about till yesterday. Sorry Brooke! Check, first thing I did. 4. Tell up to six outrageous lies about yourself and at least one outrageous truth. 1. When my mother was pregnant with me she wanted to name me Bernadette and call me Bernie. 2. I recently attended a conference where I saw someone get so drunk they fell, hit the wall and broke their nose. 3. I drive a classic car and love it! Don't think I will ever part with it. 4. I have 5 boys and all their names start with the letter R.
5. Hubs and I are trying to buy 15 acres of land and raise cattle. 6. When I was younger I wanted to be a pilot because I have a great sense of direction. OK now you get to tell me what you think is the truth or not. 5. Nominate some creative writers who might have fun coming with some outrageous things. These women are awesome. I love reading them! 6. Post links to the blogs you nominate and leave a comment on each one letting them know. okay i'll say that the broken nose is a truth. crap - i just forgot that i never told yall which one my truth was! Holy smokes those lies are fabulous. I am not going to guess I know the truth, but I lol'd at many of your lies. They were so good I would hav ethought I came up with them. I'm just stopping over from Brooke's blog. 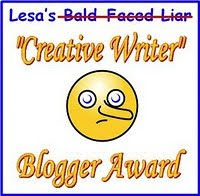 She gave me an award, too, & I wanted to see what the others' had to say! I'm from Texas, too (near Houston), so I thought I'd say Howdy!! I don't have a clue about your lie/truth, but I'm going to guess #1! Take care!